Eating nuts and seeds regularly has shown to improve heart health. We’ve discussed previously that our bodies need good fats. Nuts contain mono and poly-saturated fats that provide benefits to the heart in addition to Vitamin E, and plant sterols. Replacing snacks like crackers, cookies and chips with nuts will help improve cholesterol, plus fat is much more satisfying than processed carbs and will keep you fuller longer. Of course, nuts also have a variety of nutrients such as protein, fiber and omega 3 fatty acids. 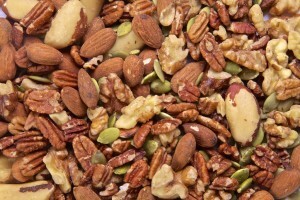 Choose raw nuts rather than those that have been mixed with canola or vegetable oil and salt. For optimal health, take some time to soak your nuts prior to eating them. You’ve likely been told at some point that nuts are fatty and high in calories. Yes, they sure are. That’s what makes them such a good snack. They satisfy cravings, keep a person satiated and provide a lot of flavor. Calorie restrictive diets have been known to cause all sorts of troubles for people because they focus on calories in, rather than nutrients and whole foods. Most of the time, people on calorie restrictive diets end up having a difficult time losing fat, and if they do lose they ultimately have trouble keeping it off. There are a wide variety of nuts in this world, so enjoy them and discover which ones best suit you! If you’d like to know more about how to fuel your body our nutrition department is here to help. Give us a call at 604-568-6006, email schedule@kalevfitness.com, or pop by our front desk to schedule an appointment with one of our nutrition coaches.